The eligible member list will be updated each day except Tuesdays (due to entries) with a list of those members that are eligible to participate in MHSRA/Jr. High sanctioned events. If your name is NOT on the list below, you ARE NOT eligible to rodeo, cow cut, rein or participate in any MHSRA sanctioned events. Please see the Membership Information page for more information and an application check list. All members owing turnout fees or fines from any previous rodeos will not be eligible to enter or participate in any MHSRA sanctioned events until payment has been received at the State Office. If you see a red circle with a line through it, that means you have signed the ReAct Pledge to not use tobacco products. 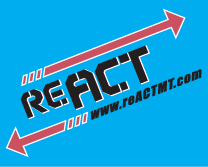 Once you sign the pledge your points will start for the ReAct rodeo series. Pay turnout fees that are owed from any previous rodeo/cutting. Submit medical release signed by a physician if you were a med out at a previous rodeo/cutting. Submit a complete and correct membership application along with all required documents (see check list on Forms page). Submit previous SEMESTER grades. Grades must be submitted twice per year (refer to MHSRA Ground Rules).